Recently. we’ve listed the Most Unique Summer Festivals, Summer Music Festivals, Free Summer Concerts and Where to Watch Outdoor Movies. 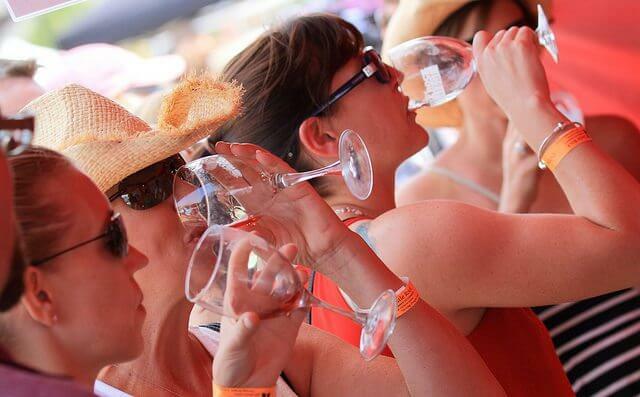 Now it’s time to list the Food, Wine & Beer Festivals taking place this Summer 2016 in Colorado! 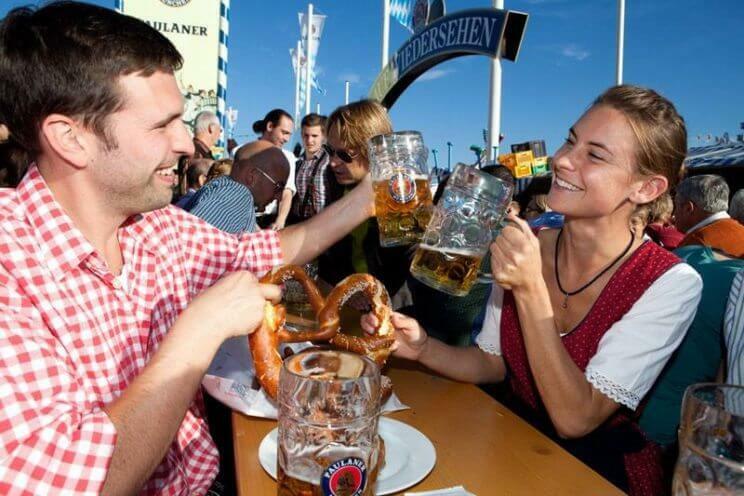 Denver’s Biergarten Festival is family-friendly cultural event that offers traditional German food, entertainment, live music, dance groups and of course, beer. The event is open to the public and provides an atmosphere of German summer family time together, reminiscent of the times families spent in the Biergartens throughout Germany. The event will offer several games and activities for the children. Enjoy Colorado wine in the Mile High city! The Mile High Wine Fest will feature Colorado produced wines, live music and vendors. 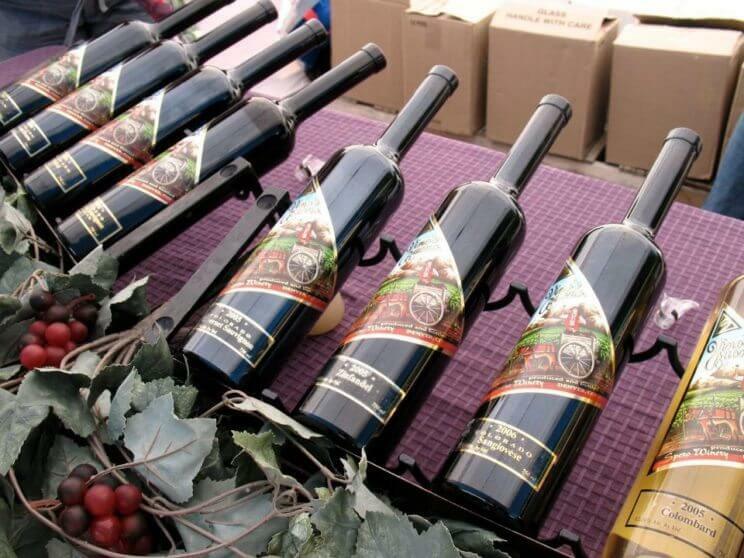 Over 20 wineries and vendors, four food vendors and three local music acts will participate. 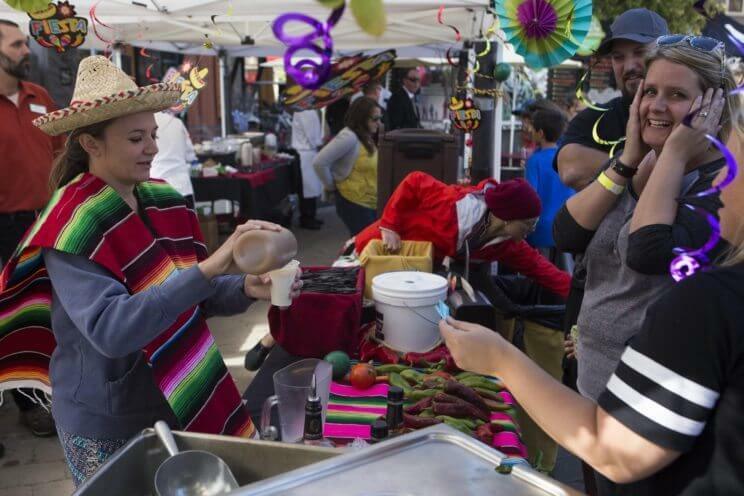 Tequila & Tacos, presented by Winter Park & Fraser Chamber of Commerce, will feature a morning bike ride, Tequila & Tacos tastings, a festival, live music, dinners and happy hour! 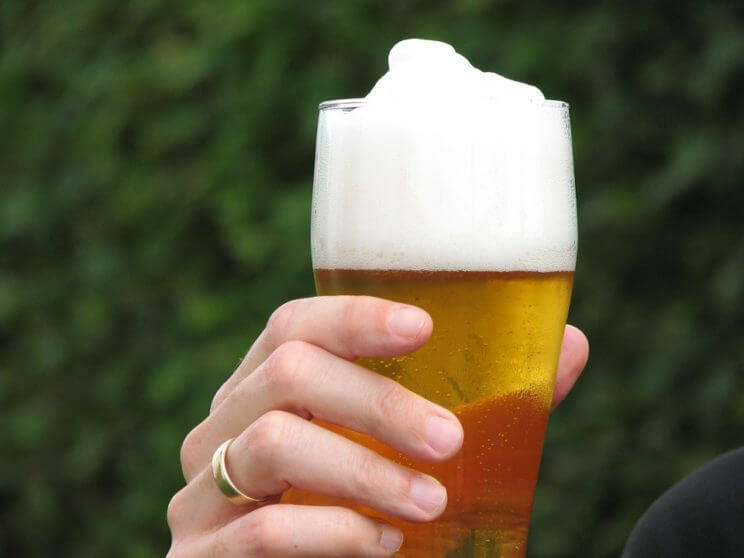 The 20th Annual Colorado Brewers Rendezvous takes place at Riverside Park in historic downtown Salida, Colorado, in partnership between the Salida Chamber of Commerce & Two Parts. 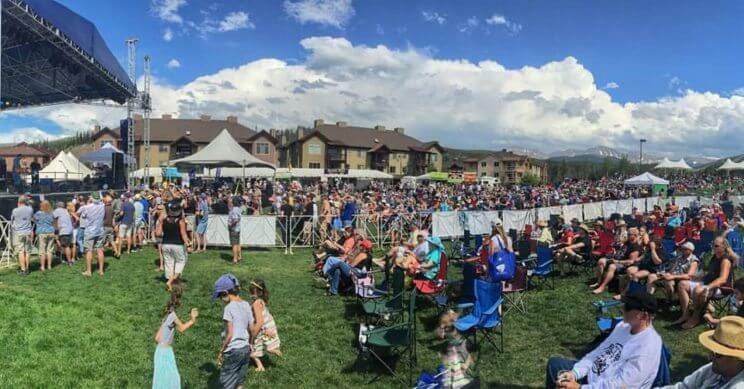 Salida, surrounded by soaring mountains and hugged by the Arkansas River will feature live music throughout the event with great food vendors offering up tasty concoctions to pair with your favorite beers! 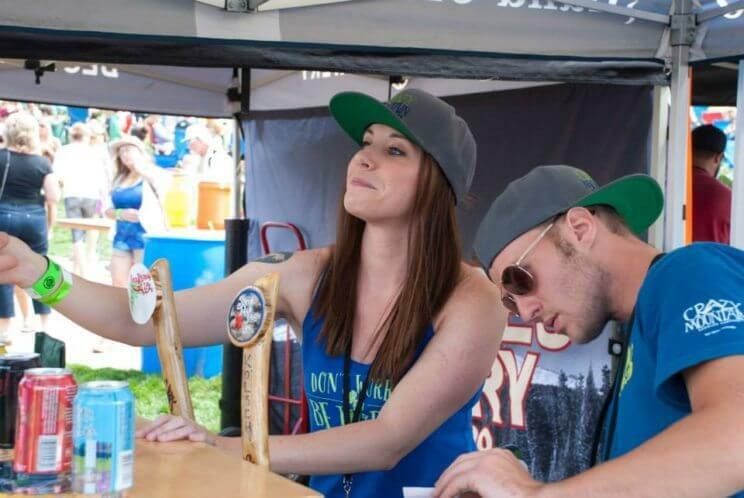 The event features over 80 Colorado Breweries with over 300 samplings of beer offered. Sorry, no dogs allowed in park. 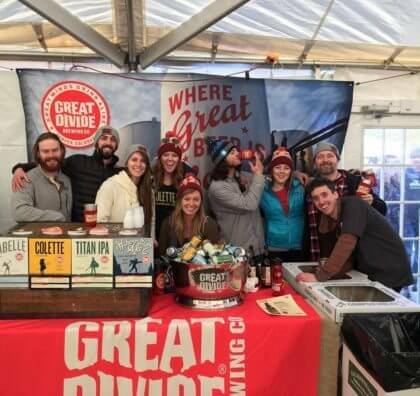 Photograph by ©Great Divide Brewing Co.
Kyle’s Brew Fest is a special pre-Red Rocks crafted beer festival with a performance by the Kyle Hollingsworth Band at Great Divide Brewing Co. RiNo location. This Brew Fest benefits Conscious Alliance and will feature beer tasting from over 30 breweries and over 60 craft beers! 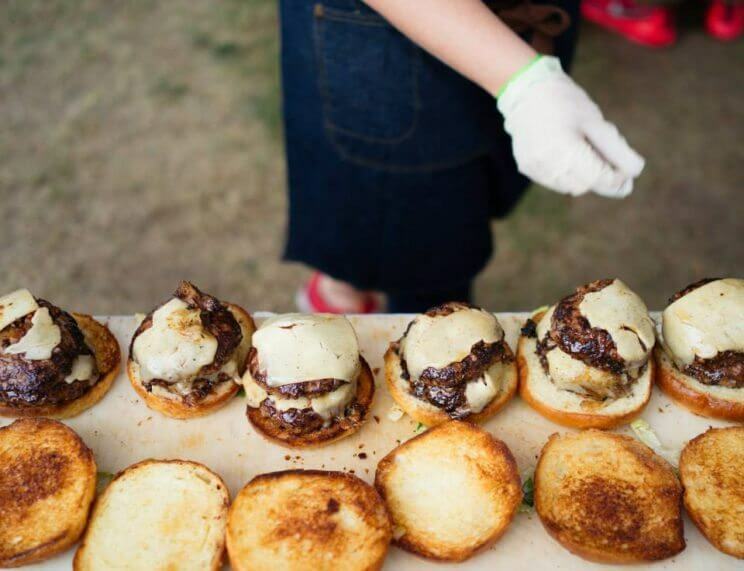 Park Burger presents The Denver Deluxe, a summertime festival featuring live music, craft beer, and gourmet burgers. 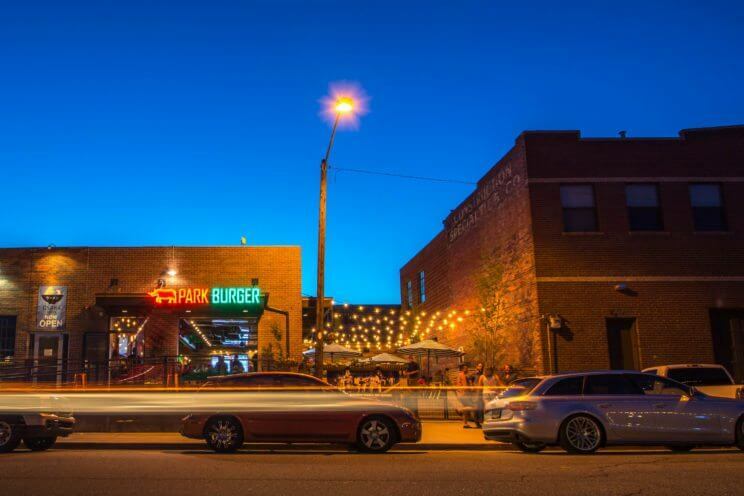 Park Burger will shut down an entire block across Walnut St., where attendees can enjoy a beer garden, burger stations and bands from the main stage! 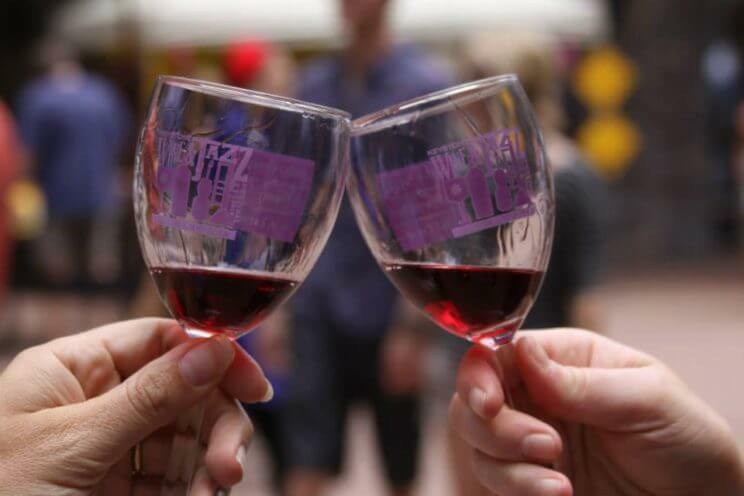 The Castle Rock WineFest, presented by the Castle Rock Chamber of Commerce, is an outdoor tasting event that will offer more than 24 wineries and over 180 varieties of Colorado wine. 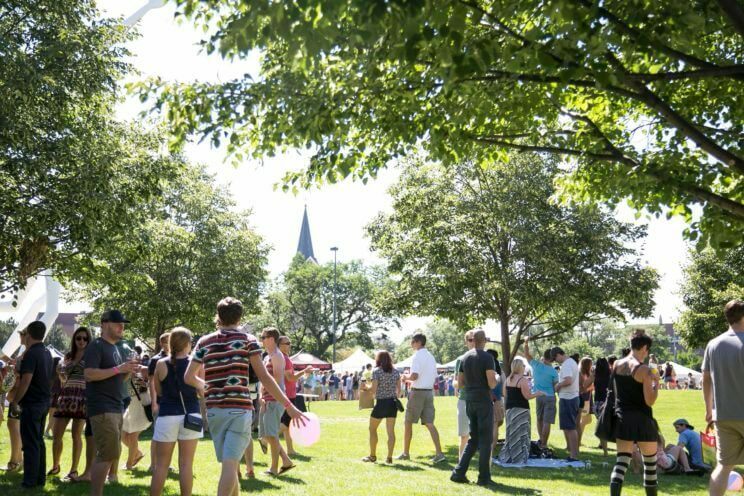 This event draws wine aficionados for its tastings, cooking demonstrations, fabulous food trucks, and an amazing local band to dance into the night. Keystone’s Wine & Jazz Festival, presented by Keystone Festivals and produced by the Keystone Neighbourhood Company, will take place at River Run Village will feature hundreds of wines, wine seminars and deluxe jazz ensembles! Learn about different regions and the delicate nuance of flavors that evolve the finest vineyard blends, enrich your knowledge by attending the professional wine seminars and discover which wines and foods harmonize with your favorite selections and enjoy live music from national Jazz musicians. 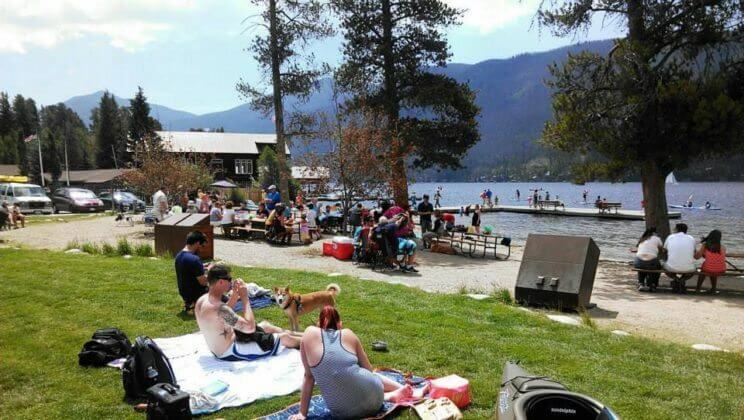 Join Grand Lake in its 69th Annual Buffalo Barbecue Weekend! This summer’s can’t miss event will host a weekend stuffed full of fun and excitement. 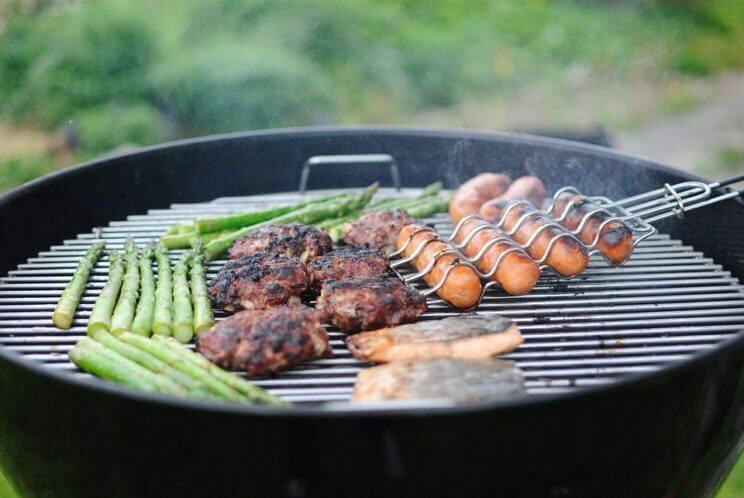 See the biggest parade of the summer with an all-bets-are-off water zone, the 33rd annual Buffalo Stampede 5K, Live entertainment, community events, and of course, many delicious varieties of barbecued buffalo. Denver Brew Fest’s Summer Brew Fest edition is an indoor/outdoor event which hosts 100+ brews, food vendors, live music and more! This event benefits Swallow Hill Music Association. 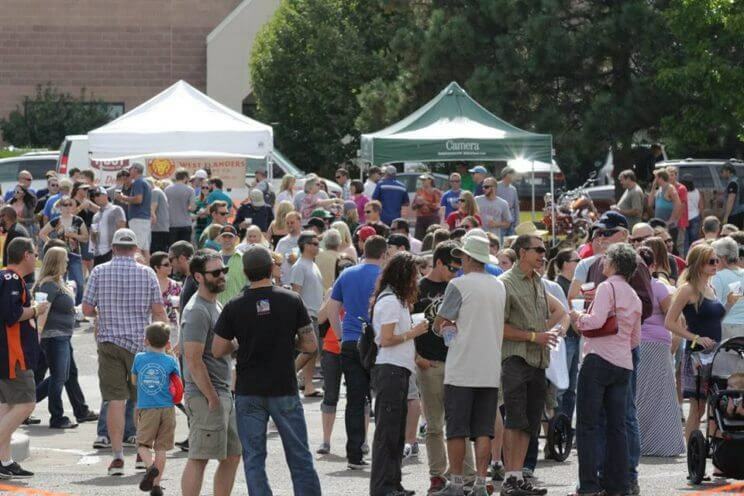 Arvada on Tap – A Craft Beer & BBQ Fest, presented by City of Arvada and produced by Arvada Festivals Commission, features a variety of ales, lagers, pilsners and other unique offerings from local and regional craft breweries as well as Kansas City Barbecue food. Cost: Free Admission, Steak Cook-Off Competitor $100. The San Luis Valley Beat the Heat: BBQ, Brews & Chili festival is presented by the sanctioned Kansas City Barbecue Society and Rocky Mountain BBQ Association. Like any good BBQ competition, cookers will compete for prizes in chicken, pork, ribs, and brisket, steak, and the People’s Choice categories. The public is encouraged to come on down to Cole Park & sample some of the best BBQ from around the US. 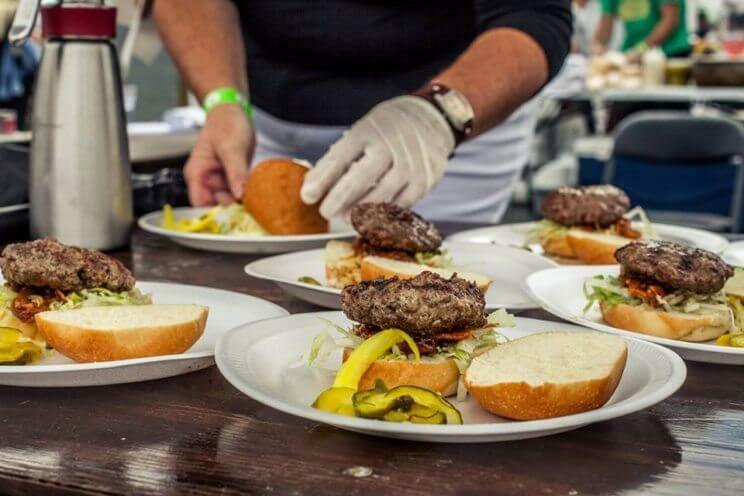 The Annual Colorado Burger Summit, presented by All American Food Fights, features 20 of Colorado’s greatest chefs competing hopes of winning the title of Colorado’s Best Burger. That title wins them a spot on the nationally televised World Food Championships in Orange Beach, AL. The Denver Burger Battle is a Burger Cook-Off event where you get to taste the top 15 burgers in Denver and vote for a winner! Net proceeds go to event non-profit, Kossler Foundation, and will be distributed to charities in Denver helping hunger, economic development, & child welfare. The Denver Burger Battle will also feature beer and spirits with special guest judges Ben Higgins & Lauren Bushnell (“The Bachelor”), Tommy Lee (Uncle, Hop Alley) & Dana Rodriguez (Work & Class). The Denver Beer Olympics is a non-profit organization that raises money for Leukemia & Lymphoma Society (LLS). 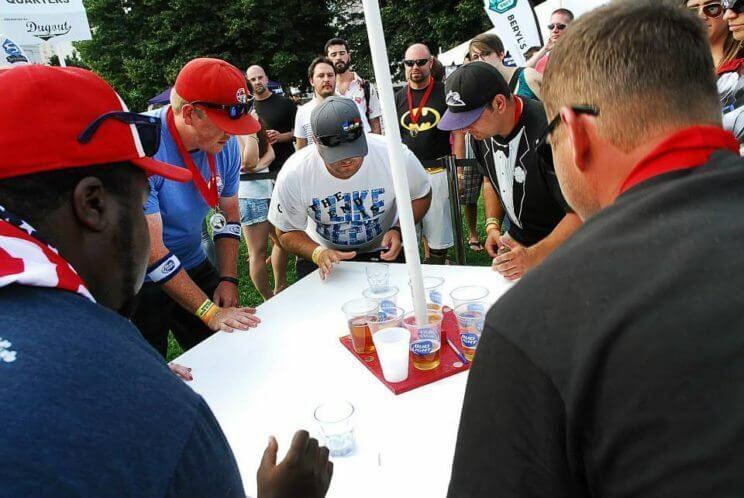 The main event will host fun, but fierce beer-drinking events to test the skill and drinking ability of any who are willing to take the challenge. The teams are co-ed and participation is mandatory. Points are awarded to your team based upon how well you do in each event. There will be a bit of strategy in picking your events, some events require all four team members to participate, others are just two. There will be a prize for the first, second, and third place teams. The 3rd Annual Sesh Fest, presented by Two Parts, features dozens of breweries paying homage to session-style beers at the Highlands Masonic Events Center. With a new location comes plenty of food, lawn games, and music to complement Colorado craft beer! Sesh Fest invites breweries to pour beers of the lighter, more sessionable variety, which means they are all under 5% ABV — all of them designed with your day drinking pleasure in mind. Vino & Notes in Woodland Park, Colorado, brings together some of Colorado’s finest wineries, with great jazz and food to benefit Habitat for Humanity of Teller County. 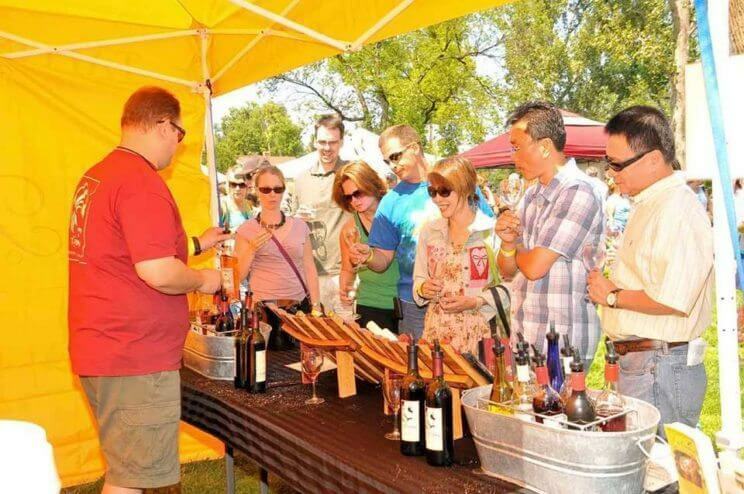 Over 20 Colorado wineries will showcase their wine along with numerous vendors and musical performances. 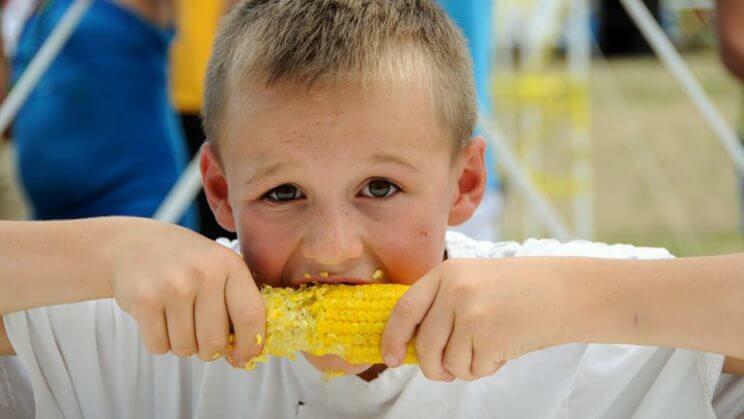 The Olathe Sweet Corn Festival includes all the sweet corn you can eat as well as Beer and Wine Garden, featuring beer and wine made from local ingredients, live entertainment, non-profit booths, corn and corn dog eating contests for adults and kids and food, art and craft vendors. 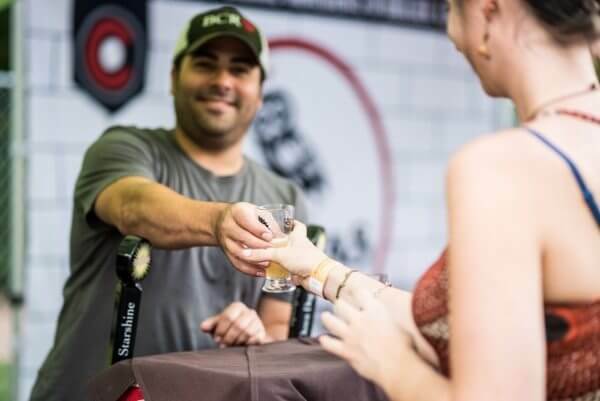 The Winter Park Beer Festival features unlimited craft beer tastings by over 40 breweries and over 100 types of beers, local food & retail vendors, live music from Colorado bands and more! 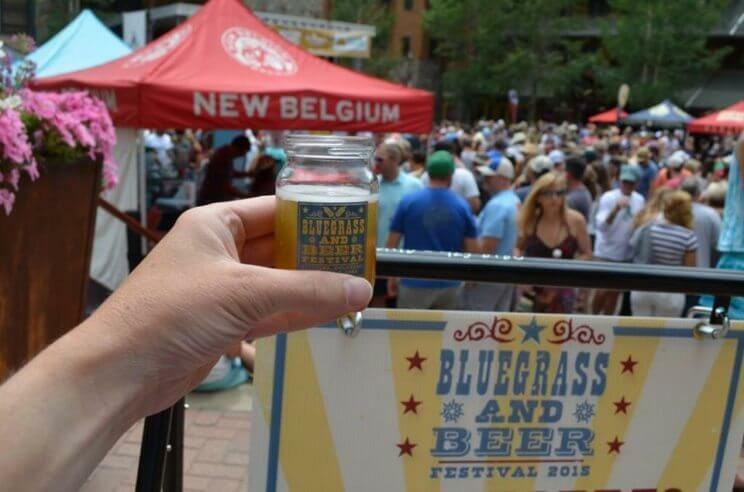 Keystone’s Bluegrass & Beer Festival will be celebrating its 20th anniversary this year! Join Keystone Festivals for their 20th Annual Bluegrass & Beer Festival which will feature over 40 breweries pouring their craft beers along with 16 of the best bluegrass bands playing on three stages. The 13th Annual Steamboat Wine Festival offers a variety of experiences on the mountain, in restaurants, classrooms, and around town, which can increase your knowledge, and enjoyment of food and wine as well as the experiences Steamboat Springs has to offer, with nearly 600 wines, spirits, beer & some of the region’s finest restaurants showcasing their talents. 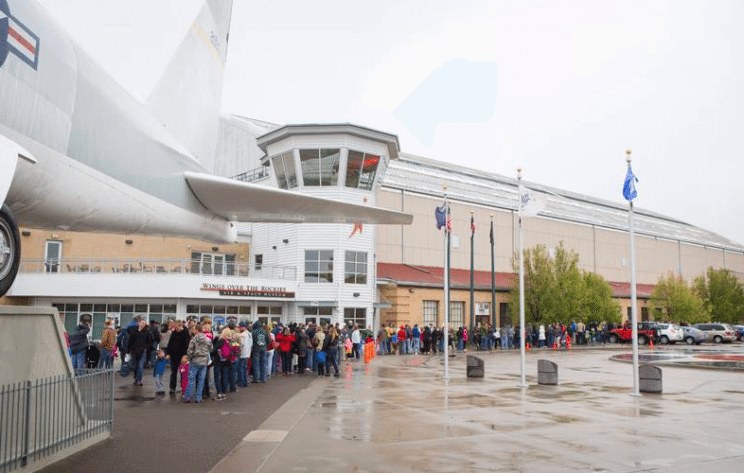 Celebrate the end of summer with the Hops in the Hangar event at Wings Over the Rockies Air & Space Museum! Event highlights include: 40 breweries, BBQ, live Music and classic cars. 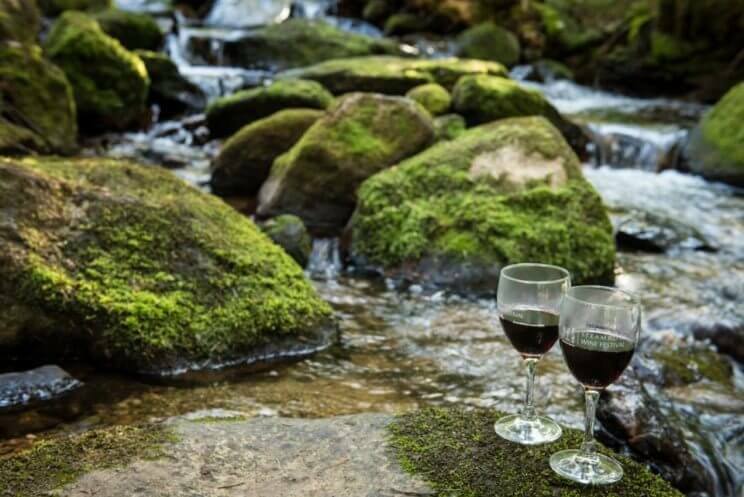 Enjoy Colorado wine in the mountains of Colorado, the Estes Park Wine Festival will feature Colorado produced wines, music, vendors, and more! 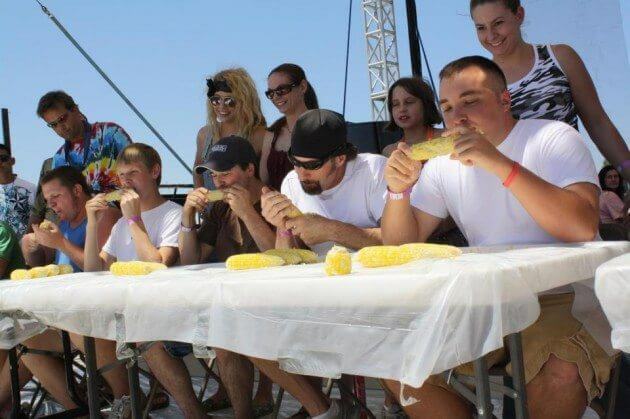 The Loveland Old Fashioned Corn Roast Festival will include a parade, corn shucking contest, delicious boiled and roasted corn and live entertainment for all ages. “May the Corn Be With You” is this year’s theme that will be tied throughout event festivities including the Corn Roast Festival parade. The Old Fashioned Corn Roast Festival offers family fun, adventure, entertainment and interactive activities. 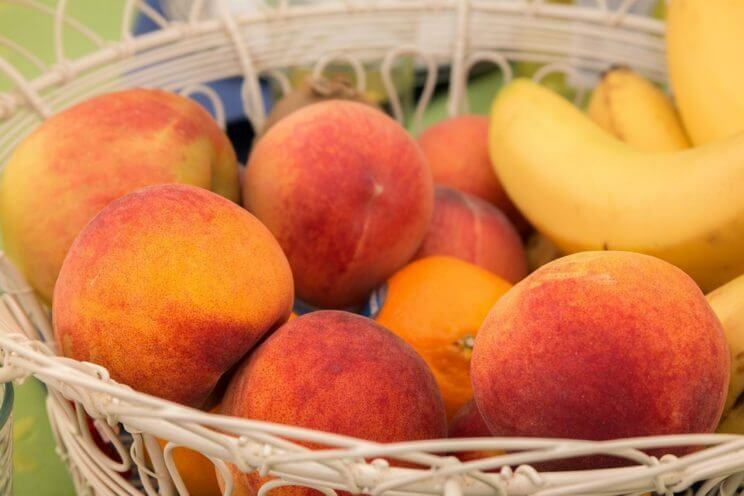 The Palisade Peach Festival, presented by the Palisade Chamber of Commerce, is one of the original agricultural festivals in Colorado honoring rich bounty and history. It’s Peach Mania! 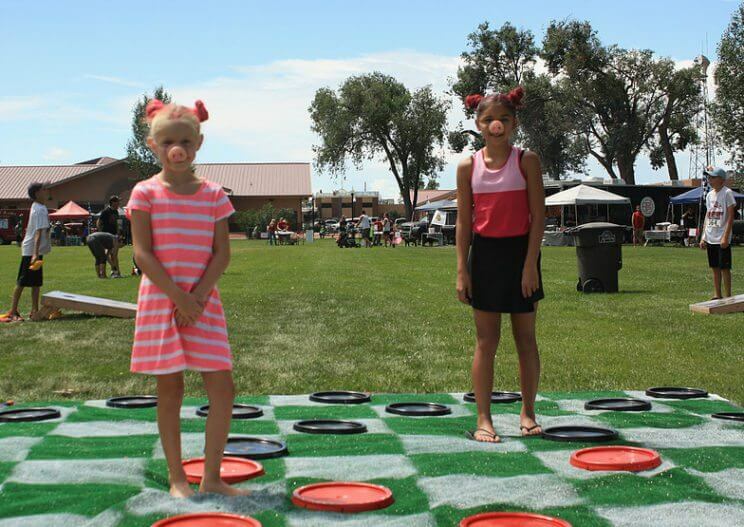 Plenty of great food, entertainment, contests, activities for kids, and opportunities to explore Palisade via outdoor recreation. 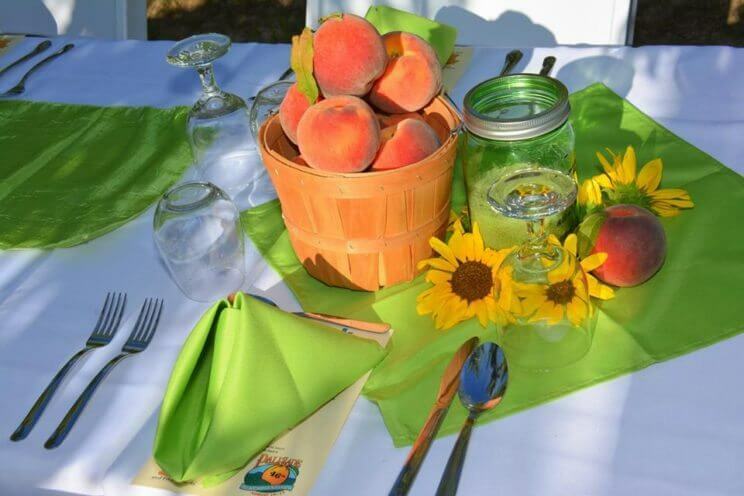 The Lafayette Peach Festival, presented by Lafayette Chamber of Commerce, centers around world-famous all natural Palisade, Colorado peaches. Enjoy peach pies, peach cobbler and peach smoothies. Food vendors, crafters, antique dealers along with some of the finest artists from the Front Range and Western States will be showcased. Children’s activities, live entertainment and music throughout the day. 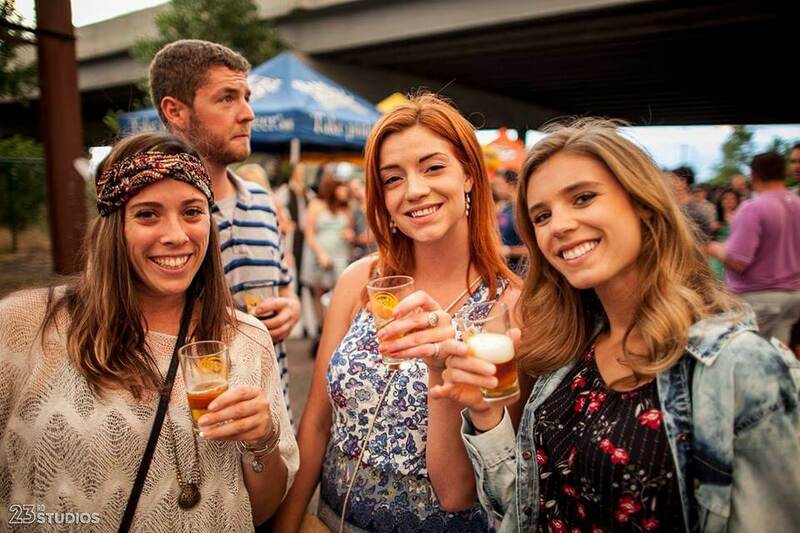 The 3rd Annual Boulder Craft Beer Festival, produced by Downtown Boulder, brings together the best craft breweries from Boulder County and beyond for a tasting festival, offering attendees samples of Boulder’s best beer. The festival includes music, lawn games and food for purchase. The Polish Food Festival in Denver is an annual celebration of Polish culture, food and ethnicity. Cost: Big Top Cheese Pairing $25, Colorado Cider & Beer Circus $35 and Up, Circus Sunset 5K $25. 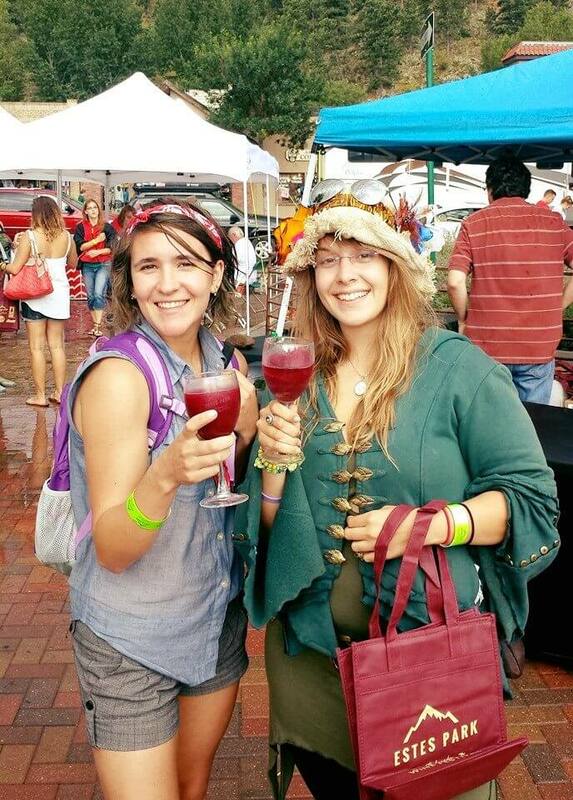 The Colorado Cider & Beer Circus brings a unique element to a cider and beer tasting with amazing entertainers including jugglers, aerial arts and more. Family Entertainment can be found at the ‘Cider Circus’. They’ll have cider-making demonstrations, kids crafts and great food provided by Copper Mountain’s incredible selection of restaurants. This festival will also include the Big Top Cheese Pairing event and a Circus Sunset 5K event. 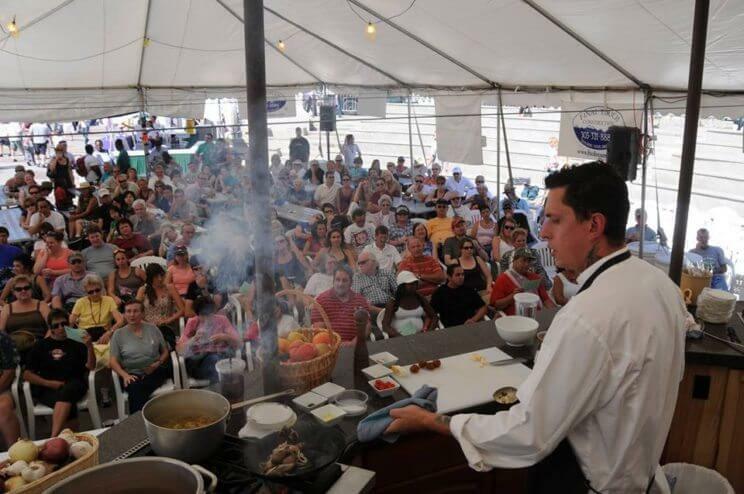 A Taste of Colorado, taking place at Civic Center Park over Labor Day Weekend, will feature more than 50 of Colorado’s favorite restaurants and food establishments that will gather at the Festival, featuring small portions to full meals. Discover ethnic specialties or indulge in your traditional favorites. An elegant Fine Dining Area is showcased, highlighting gourmet cuisine from renowned chefs and offering daily cooking demonstrations. Live music will be available on six different stages, arts, crafts, carnival rides, games, play equipment, a great variety of free, hands-on craft activities, plus plenty of music, magic, clowns and puppets on the KidzStage. The Denver Food + Wine Festival is a six-day extravaganza of food, wine and spirits events. 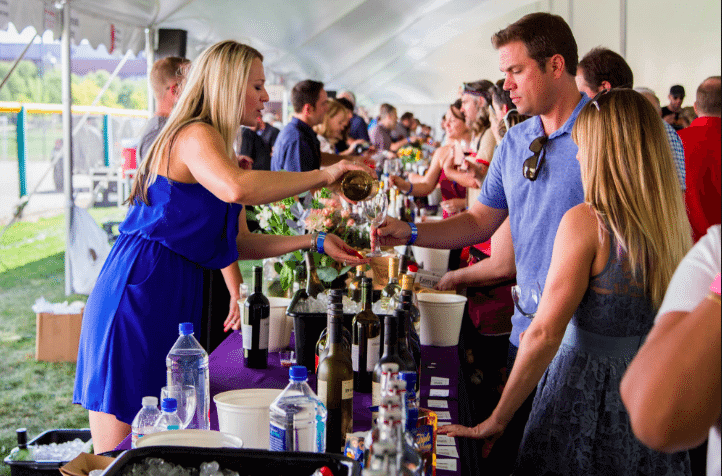 Festival events feature the best in Colorado’s restaurants paired with the finest wine and spirits, dinners, tastings and culminating with the festival’s signature event, The Grand Tasting. The Lafayette Brew Fest will feature 25+ participating breweries and cideries are from all within 75 miles of Lafayette. They bring great beer, cider and meads for you to taste. 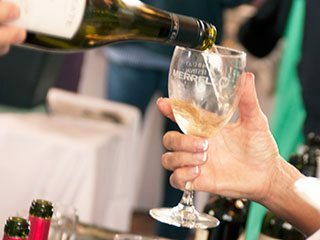 The Breckenridge Wine Classic features more than 100 food artisans, wineries, breweries, distilleries, epicurean purveyors, and locally made products in a festival that is an ultimate food and wine experience. 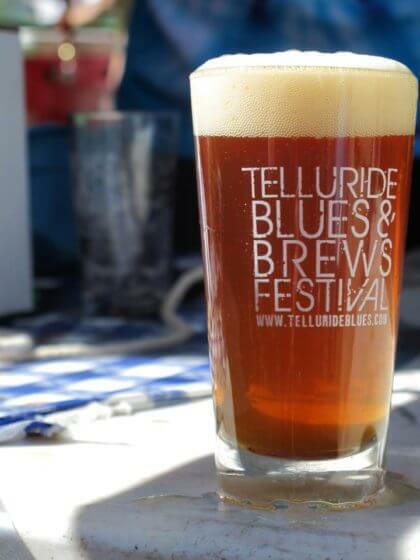 The Telluride Blues & Brews Festival is a three-day celebration of live music and microbrews held at Telluride Town Park. The festival offers an eclectic mix of live blues, funk, jam band, rock, gospel and soul performances, and some of the best microbreweries in the country, with a wide variety of food and craft vendors, children’s activities, late night shows, and much more. 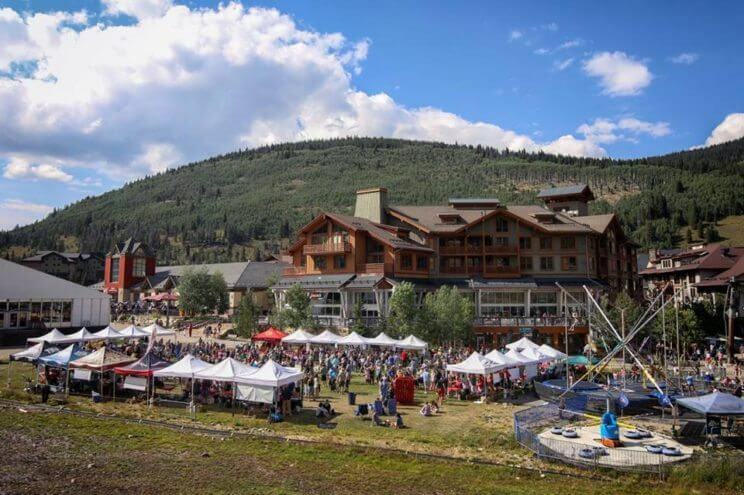 The Copper Mountain Chubby Chili Pepper and Whiskey Fest is a festival that allows you to sample a variety of chili concoctions with whiskey pairings that will get your taste buds fired up! Take a scenic ride while the Aspens are aglow and finish your day at Copper Mountain with free live music.